Why do architects like SolaRay panels? Why have your design constrained by ducting, return venting, heating vents, locating wall or baseboard heaters, or where to place a furnace or heat pump? Ducoterra’s SolaRay infrared heating panels are an ultra thin 1/2″, blend seamlessly into any living area, and can be painted to match the room decor. SolaRay radiant heating panels are placed on the ceiling, so you don’t lose any floor area like you would with vents, baseboards, or wall heaters. Being on the ceiling, this allows for free placement of windows, doors, and occupant furniture. And since these panels operate completely silently, they are great for bedrooms. This simple and proven technology has undergone considerable change in the last couple of decades and is widely used in Europe, where energy costs are higher than in the US. SolaRay heating panels have an industry-leading 20-year warranty with an expected system lifetime of 40 years according to the NAHB®. Fully zone controlled heating for greater cost savings. While wall and baseboard heaters are inexpensive to purchase and install, they have hidden costs. Due to inefficient heating, wall and baseboard heaters typically use 50-100% more energy and cost more to operate than SolaRay radiant heating panels. In just 3 to 6 short years, SolaRay heaters pay for themselves over wall heaters or baseboards. Not only that, but over a 30-year life of a home, homeowners would have to replace the wall or baseboard heaters at least 3 times due to their limited lifetime, making them even more costly. 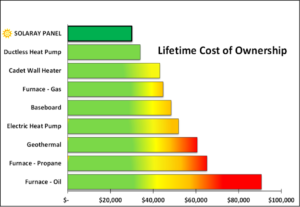 Ducoterra’s SolaRay heating panels also work hand-in-hand with other systems, like ductless heat pumps, creating a more cost effective heating system while maintaining a high standard of comfort and energy efficiency. Central or point-source systems will often leave some rooms too cold and that’s where SolaRay panels can plug the gaps, typically in bedrooms and bathrooms. Ducoterra’s SolaRay panels have no moving parts, no motors that can wear out, and no filters that require cleaning or replacement. 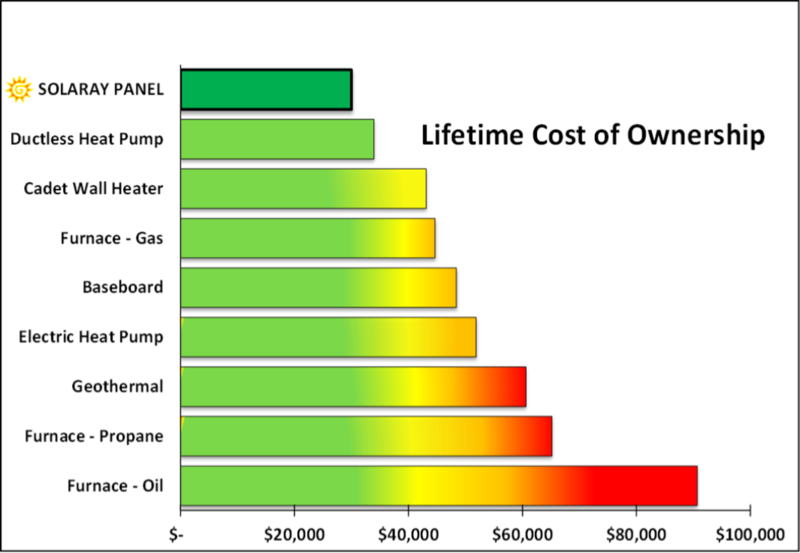 All of this means that SolaRay radiant ceiling panels are completely maintenance-free and highly reliable as evidenced by the NAHB-recognized 40 year average lifetime.